Sherlock Holmes. Essanay Studios 1916. Not very long after I started this blog, I realized that I was reviewing so many Sherlock Holmes films that they would probably qualify for their own genre category. It seems like I’ve covered more than is tagged there, but it’s still a healthy sampling. My fondness for Sherlock Holmes stories far predates Yesterday’s Movies, so I find myself running out of eligible and desirable films to review. The list of adaptations seems endless, but once I apply my criteria for a review selection, they’re just about dried up. As well, I have no intention of leaving recent and future films to age into eligibility before watching them, so I’ve decided to give Sherlock a retirement sendoff with a themed month of some of the most notable films. It is only right, then, to begin with the silent film adaptation of the very first official adaptation of Doyle’s work. 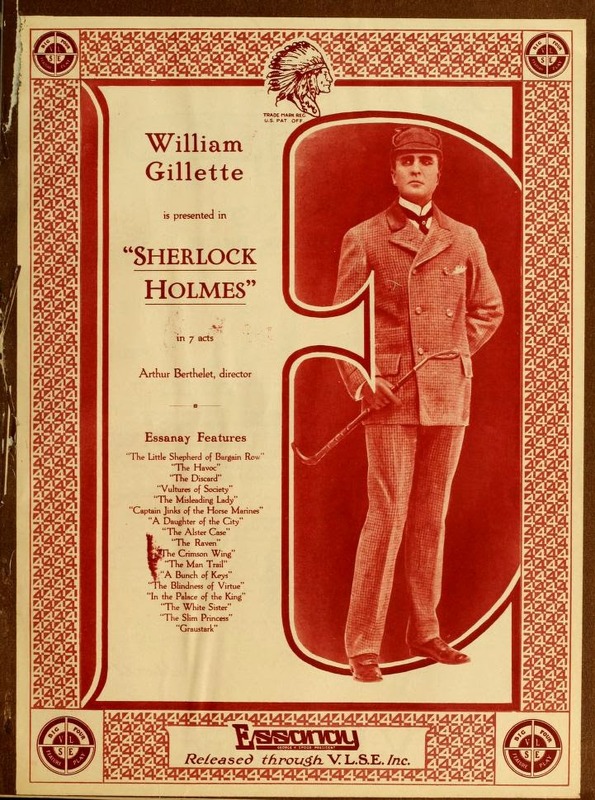 William Gillette was given an attempted stageplay by Doyle and tasked with rewriting it into something serviceable, and also starred as Holmes. Holmes’s iconic deerstalker hat, calabash pipe, and “Elementary, dear Watson” all came from Gillette. This is a historic piece of Sherlockiana. Bonus mini-review: Sherlock Holmes Baffled (1900) – In his first-ever film appearance, the world’s greatest detective is no match for camera magic.